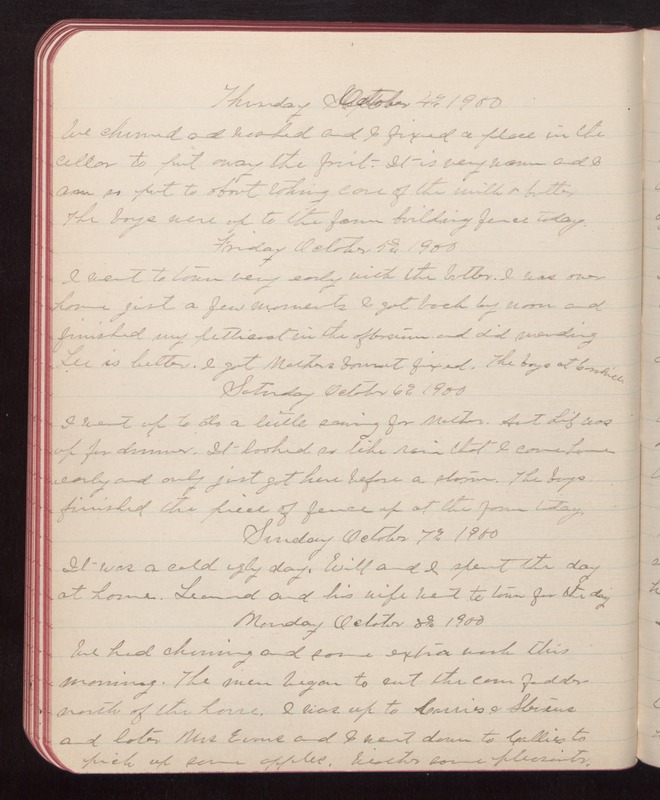 Thursday October 4th 1900 We churned and worked and I fixed a place in the cellar to put away the fruit. It is very warm and I am so put to about taking care of the milk & butter The boys were up to the farm building fence today. Friday October 5th 1900 I went to town very early with the butter. I was over home just a few moments I got back by noon and finished my petticoat in the afternoon and did mending Lee is butter. I got Mothers bonnet fixed. The boys at Coralville. Saturday October 6th 1900 I went up to do a little sewing for Mother. Aunt Lib was up for dinner. It looked so like rain that I came home early and only just got here before a storm. The boys finished the piece of fence up at the farm today. Sunday October 7th 1900 It was a cold ugly day. Will and I spent the day at home. Leonard and his wife went to town for the day Monday October 8th 1900 We had churning and some extra work this morning. The men began to cut the corn fodder north of the house. I was up to Carries & Stevens and later Mrs Evans and I went down to Callies to pick up some apples. Weather some pleasanter.